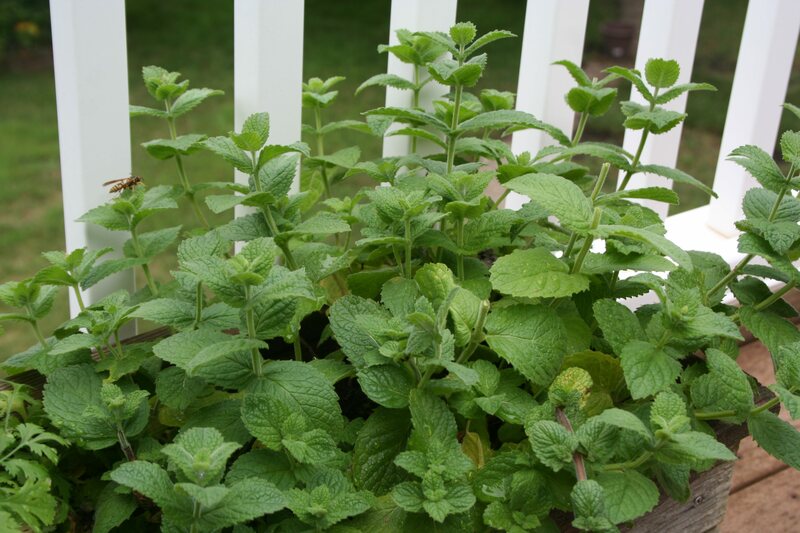 This is a pretty and beautifully aromatic mint. 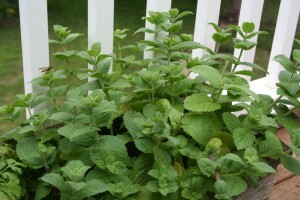 This spring, I bought some apple-mint plants at Ecogardens in Northfield. This is one of the prettiest mints I’ve grown and the flavor adds so much zest to beverages. Much of this summer I have been “mojito-ing” my iced teas, by muddling the apple-mint with sugar and then adding some lime juice. It’s an instant pickup in the middle of the day. Sunday, I decided to try something different, making a minty iced tea with hints of passionflower and ginger. It’s incredibly easy to do and provides a great excuse to drink iced tea out of a mason jar. The color is wonderful, but it tastes even better. Then, I made a light simple syrup mixture of 1/4 cup of sugar with 1/2 cup of water. Mix the water and sugar and bring it to a boil. Then into the syrup, I added the zest of two small, organic lemons and about 6 mint leaves. Let this marinate for at least 20 minutes. Drain out the leaves and add the syrup to the tea along with the juice of the two small lemons. Delicious! This is a refreshing herbal tea and not too sweet. If you like your tea sweeter, go to a 1-to-1 simple syrup mixture (1/2 cup sugar to 1/2 cup water). What’s your favorite herb beverage? That sounds really great, it’s been so long since I’ve had a cup of the Tazo passion tea, it used to be a staple around here. Right now I’m loving vanilla rooibos tea with herbs. 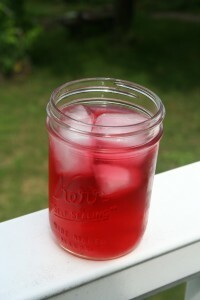 I have been making sun tea then it doesn’t get as hot and I don’t have to heat up the kitchen. Thanks for commenting, Susy. Rooibos tea is the one that I scalded by using boiling water — too strong that way. I’ll try the cold brew method with that one — maybe with a ginger infusion? I wanted to drink 🙂 Greetings from Poland. after reading your post on teas, went out and cut some tarragon, spearmint and basil leaves. after muddling them i added 2 cups of water in a mason jar and placed in the fridge. I will have a glass after dinner. I have some passion fruit vine and roselle (Hibiscus sabdariffa) plants growing hoping to try the hibiscus/passion fruit combination as soon as i have some fruits. Sounds like a great combination — very refreshing.